Well, the Tata Steel results came in a week ago, and I was hit-and-miss with my predictions. I had Anand winning the A group, but his non-winning streak in regular tournament play continues for at least a few months more. Instead, he finished half a point behind the winner, Hikaru Nakamura. This must be Hikaru’s biggest win to date, and it takes him up to about 2775 FIDE. He was briefly #7 on the live list, until Chucky’s amazing 9/10 in Gibraltar vaulted him slightly ahead in the rankings. The Tata Steel (formerly known as Wijk aan Zee, before being called Corus) super-tournament is underway now. The field is pretty much as good as it can get in my view. No “boring” 2700s were invited this time around. With two rounds already in the books, it’s a bit late for predictions, but I did think Anand might finally break his tournament-non-winning streak this year. For the B and C groups, I’ll go with McShane (I have to admit I was influenced by his 2/2 start) and then a tie between Bluvshtein and Vocaturo. Anand did get off to a good start with a solid win as black against Ruslan Ponomariov. Back in Bilbao and Shanghai in late 2010, he played the Berlin every time against 1.e4. But in London, he played the Sicilian in all his black games, and he repeated his once-favorite Najdorf against Ponomariov. I remember Grischuk said something to the effect that “Ruslan doesn’t understand the Najdorf,” but I think that was mostly in regards to Pono on the black side. The Tal Memorial started today in Moscow, and it’s a great lineup. In fact, I can’t remember a top round-robin with as exciting a field in the past few years. As much as I’d like to see Anand play well, he hasn’t been a very compelling tournament player recently, so I’ll happily take Aronian, Kramnik, and Grischuk representing the 2770+ crowd here. The rest of the field with Mamedyarov (2763), Karjakin (2760), Eljanov (2742), Gelfand (2741), Nakamura (2741), Shirov (2735), and Wang Hao (2727) is filled with a nice blend of young fighters and grizzled veterans. Last week in the USCL, the SF Mechanics played the Seattle Sluggers. At the time, the Sluggers were 1 match point behind us, so with a win, they’d tie us for first in the division. There was some controversy over the match date and lineups. I wrote about this on the Mechanics blog (here), Seattle responded (here), and I responded in the comments section (here) – that seems to have ruffled some feathers in Seattle. In any case, due to the change, I had the white pieces against GM Hikaru Nakamura. I beat him last year in league play (the game can be replayed here) and narrowly missed beating him in rapid play in Germany this summer (see the post here). He’s the highest rated player in the league, and after crossing 2700 FIDE on the October 2008 rating list, he’s the 2nd-highest rated player in the US behind GM Gata Kamsky. The game can be replayed on the USCL site, here. Hikaru showed up late, so he lost 7 minutes on the clock. An offbeat line. Hikaru has normally played 6…e5 here, but he also plays everything under the sun so I wasn’t expecting any specific opening. A rather eccentric move. When I looked over the game, I hadn’t expected to find this move in the database, but there were over 300 games with it! It reminds me a bit of 1.e4 Nf6 2.e5 Ng8!?!?. I was alerted to the existence of this line when flipping through a copy of Khalifman’s “Opening for White According to Anand, Volume 5”, which at least according to the table of contents, spends close to 10 pages discussing how to get +/= against this line. Anyways, I didn’t expect to refute 7…Nb8, but this can’t be the most challenging line for Black in the King’s Indian. 8.h3!? takes away the …Bg4 idea, but this may not be a move White wants to play in some lines either. 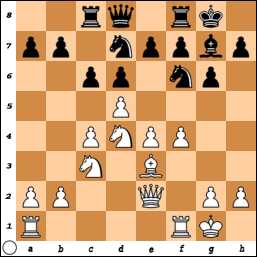 Black can also think about breaking with …e6 here, as his bishop will cover the e6 square. 9.h3 was the other major option, taking the bishop pair. After 9…Bxf3 10.Bxf3 Nbd7 White will likely play to exchange on c6 when Black plays …c6, to try and open up the position a bit for the bishops. White’s a bit better, but I decided I’d rather have a knight here. (b) 13.Bf2 tries to push e4-e5, but now the f4-pawn is a bit weak. 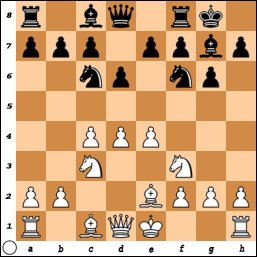 13…Nh5 , hits the pawn and covers the e5-square. Black, meanwhile, anticipates an …cxd5/exd5 exchange, when the e7-pawn will need protection. 14…e6 is not a good idea, as after 15.dxe6 fxe6 16.Nc2 , Black can play neither …e5 (because of f4-f5) nor …d5 (because of e4-e5). Meanwhile, White can even think of c4-c5 pawn sacrifices at times to secure the e4-e5 advance. 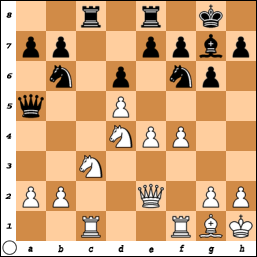 The bishop gets tucked away to prepare the e4-e5 advance while getting away from any future …Ng4/…Nh5 annoyances. 16.exd5 was my intended recapture had Black recaptured earlier. 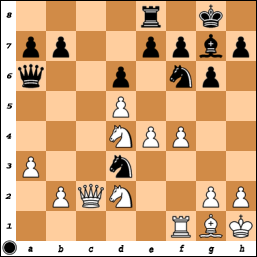 White retains a bit more control of the position, but I thought I’d only have a symbolic advantage here. The e7-pawn is somewhat weak, but Black has enough defenders while White has no easy inroads elsewhere. White was threatening 17.Nb3 Qb4 18.e5 dxe5 19.fxe5 Nh5 20.e6 Ne5 21.Bd4! f6 22.g4, trapping the knight on h5. Thus, Black has to add an attacker to the d5-pawn for now. c) 17…Nc4 18.b3 a6 19.Qxa5 Nxa5 20.Nf3 is still about equal. (b) 18.Ncb5! was the right move, and one I had spent some time on. 18…Qd8 (I had seen the nice line 18…a6 19.Nc7!! Rxc7 20.Nb3 and Black’s queen can’t stay in touch with the rook on c7. Black’s lost. For example, 20…Rxc1 21.Nxa5 Rxf1 22.Qxf1 Nxe4 23.b3 Nac3 24.Nxb7+-) 19.Rxc8 Qxc8 20.Nxa7 Qg4. I had seen this far, but was confused as what to do next. I didn’t see any good way to hang onto my extra pawn. I considered 21.Qb5 (21.Qc4! is better for White, though.) 21…Qd7 22.Qxd7 Nxd7 when objectively, the position is about equal, but I didn’t see any way to save the pawn. Black is playing …Nf6 next, to hit e4/d5 if White guards b2. Frustrated, I realized I was running low on time and just played Nb1. White had two better choices, both leading to unclear endgames. Due to the reduced material, I’d guess both should end in draws. 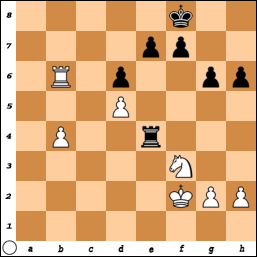 (b) 20.Nd2 Nxb2 (20…Qxe2 21.Nxe2 Nxb2 22.Rb1 Nd7 23.Nd4²) 21.Qxa6 bxa6 22.Ne2! with an unclear endgame. 21…Qd3 22.Qxd3 Nxd3 23.Rc7 is not crystal clear, but likely about equal. 23…Nxb2 (23…Ng4 24.N4f3 Bxb2 25.a4 Nxf4 26.Rxb7) 24.Rxb7 Nd3 25.Rxa7 Nxf4 In these lines, White will end up with an extra a-pawn, but Black takes a kingside pawn and has some active piece play. In some lines, he’ll also play …e6 to activate the rook along the e-file. The endgames are not crystal clear to me, but likely about equal in the end. A strange oversight from Hikaru. After the game, he explained he was under the weather, so that might explain this lackadaisical move. Black wants to bring the knight to b6, to play …Rc8, but he won’t have enough time here. 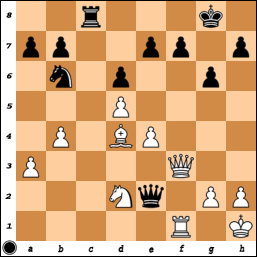 d) 23.h3 Ngf2+ 24.Rxf2 (24.Bxf2 Nxf2+ 25.Rxf2 Bxd4 26.Rf3 b6 when Black is clearly better. He has the more compact pawn structure, the bishop, and the open c-file (after …Rc8). For example, 27.b4 Rc8 28.Qd3 Qxd3 29.Rxd3 Bb2 leaves Black clearly better) 24…Bxd4 25.Rf1 Bxg1 (25…Bg7 when I think Black enjoys a steady advantage. The computer, however, finds an interesting resource: 26.b4 Qxa3 27.Nc4 Qc3 28.Qxc3 Bxc3 29.Rf3 Rc8 30.Nxd6 exd6 31.Rxd3 Bxb4 32.Bxa7=) 26.Kxg1 b6 again with a clear advantage for Black. 23…Qxa3 24.Nc4 picks up the knight. 24…g5 doesn’t save Black. The hope is to open the e5-square for the knight to retreat, but White simply plays 25.g3 , when Qb3 and b5 are still on tap. Meanwhile 25…gxf4 26.gxf4 only helps White because he can add Rg1+ to his list of threats. The finishing blow – there’s no way to stop b4-b5 next, cutting the knight of from its support. Maybe Hikaru was banking on 25.Bxb6 axb6 26.Qb3 Ra8 27.b5 (27.a4 still wins a piece, though, although after 27…Nxf4 28.Rxf4 Qxa4 , it’s marginally more difficult than in the game.) 27…Qxa3 , which keeps in touch with the knight. 25…Qb5 26.Bxb6 axb6 27.a4 also wins a piece. With the queens off the board, the rest really is just a matter of technique. Black can safely resign, but Hikaru decided to see if I could blow a piece-up ending two weeks in a row. There are, of course, other ways to win this endgame. I decided that transferring the knight to the queenside (either a5 or c6, depending on the situation) was the simplest, and for that, I wanted to have the d5-pawn protected. Right now, Black can’t approach the pawn because the knight covers e5 and d4, but once it leaves, it will be useful. The kingside pawns aren’t so important, as I just want to queen my b-pawn. 44.Rb8+ Kg7 45.b5 e4 46.b6 Rg5 47.Ra8 and Black resigned. 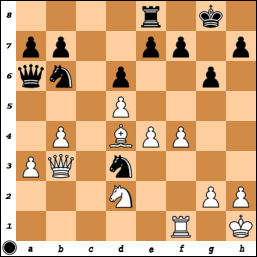 After 47.Ra8 , Black resigned because if: 47…Rxd5+ 48.Ke2 Rb5 49.b7 . The pawn queens, leaving White a rook and knight up.